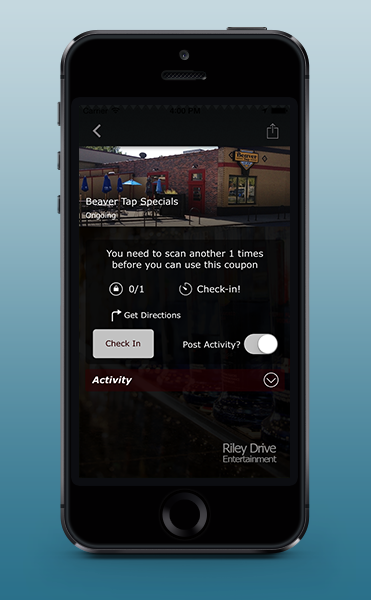 When a customer checks in at a business’s location, they will receive a reward coupon for the 10th, 25th, 50th, 100th, 500th, and even 1000th check in. This coupon system is completely customizable by the business and can be edited in real time via our clients user panel. 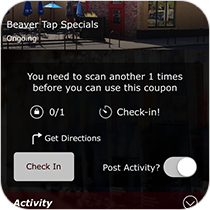 These coupons will appear as images on the application and when used they will be deleted with a push of a button on the user’s phone by the employer to ensure a coupon is not used multiple times. 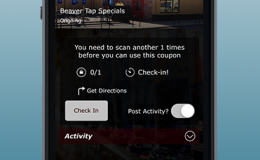 This also removes the need for additional equipment to verify the coupon such as barcode scanners or unique coupon codes, allowing a very low start up cost for businesses. This system is extremely simple, cost efficient, and very effective for small businesses to build up brand-loyalty with their customers.